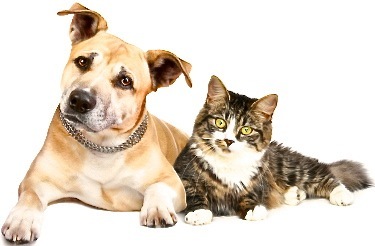 The question of getting cats and dogs to live happily together often crops up. It’s tricky – but possible. I was recently asked my thoughts. Here’s the question and my answer. I’ve changed the enquirer’s name to protect the innocent! I am hoping to be able to get a cat and a dog next year. The dog will probably be a puppy but the cat doesn’t necessarily need to be a kitten. Mostly dogs and cats live together in harmony when the cat is a relatively feisty one who will stand up for themselves if necessary. Dogs quickly learn respect for little paws with retractible claws! Scaredy cats who run away tend to be chased. Dogs usually love chasing small furry things. Terriers more than most! Not a recipe for a harmonious household! I agree that it’s harder to get two pets at once and do both justice. They take a lot of care in the first weeks! Getting a puppy at 7-8 weeks old is probably ideal. Socialisation is very important. So many problems with adult dogs can be prevented with good socialisation. There’s a key socialisation period 8-12 weeks old when puppies ‘imprint’ things around them into their mental catalogue of what’s normal. Of course, you can only socialise a puppy with a cat that you already have. Your best bet, then, is a cat who’s not a scaredy cat but a confident and steady character, probably not a kitten. Get the cat first and introduce the puppy to a cat who’s always been around. The only part of your thinking I’d question is whether or not a terrier is the best companion for a cat. It’s certainly possible and I’d seen countless terriers living with cats, but there’s a selectively bred instinct there usually to chase small furry animals! I hope that helps! Graeme Hall MGoDT, ‘The Dogfather’ is one of the UK’s leading dog trainers. Based in Northamptonshire, covering all of the UK. I’m a Master Dog Trainer with the Guild Of Dog Trainers. I’m recommended by vets. I’m one of the few dog trainers chosen by the Hollywood film industry and you’ll frequently hear me on BBC Radio. If you’re looking for a dog trainer or dog behaviorist I can come to you wherever you are – and wherever there is a dog behaviour problem to fix or dog expert advice needed. Contact me today!